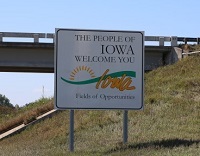 Lawless America will be filming in Iowa on April 11-12, 2013 and in Illinois on April 13-15, 2013. If you want to be filmed, please contact Bill Windsor immediately. I will be driving from Kansas City to Des Moines on April 11, 2013. I expect to arrive mid-afternoon. I will do some filming Thursday evening, if there are folks who haven’t been filmed who would like to be. On Friday morning, I will film on location in Des Moines at selected locations that are important to stories. I will leave Des Moines early afternoon and head to Tiffin, Cedar Rapids, Dyersville (Field of Dreams), and Dubuque on the way to Chicago. If there are folks along that route who would like to be filmed, I will try to do so. I will arrive in Des Plaines, Illinois the evening of the 12th. I will then film on location in Chicago the morning of the 13th (coordinated by Dr. Sheila Mannix) and at a Des Plaines hotel that afternoon and evening. On April 14, I drive to Springfield, and I will film at any important locations between Chicago – Bloomington – Springfield. If there are folks who have not yet been filmed who would like to be filmed in Springfield, I will film in a hotel the evening of the 14th. On April 15, I will film at any important locations in Springfield in the morning, and then I will drive from Springfield to St. Louis. If there are any folks along that route who would like to be filmed, I will try to do so.